Pablo Picasso, Acrobate et jeune arlequin, 1905, gouache on cardboard. At the age of just twenty, the rising genius Picasso (1881–1973) embarked on a quest for new themes and forms of expression, which he immediately refined to a pitch of perfection. One artistic revolution followed another, in a rapid succession of changing styles and visual worlds. 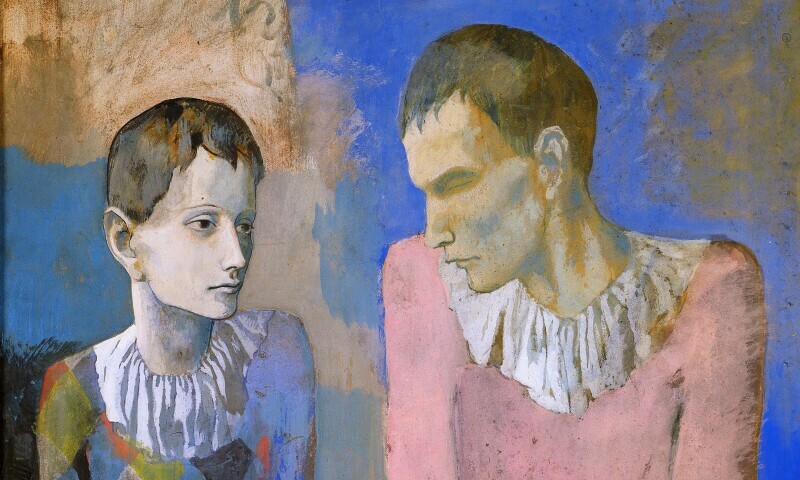 The focus of the exhibition is on the Blue and Rose periods, and thus on the six years in the life of the young Picasso that can be considered central to his entire oeuvre, paving the way for the epochal emergence of Cubism, which developed from Picasso’s previous work, in 1907. Here, the exhibition converges with the Fondation Beyeler’s permanent collection, whose earliest picture by Picasso is a study, dating from this pivotal year, for the Demoiselles d’Avignon.